When you need to understand the parts of something and see how they relate, you can create a line diagram. 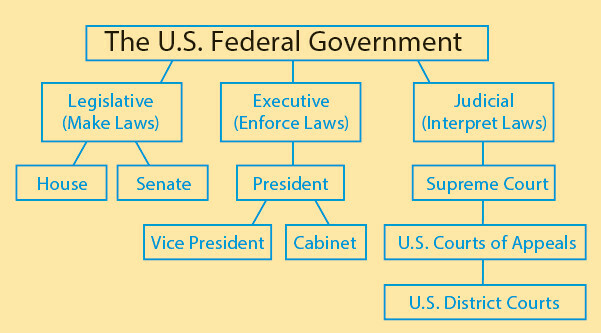 This diagram shows the three branches of the U.S. federal government, with subparts connected underneath. A line diagram can help you understand how people in your family are related, how your school is organized, or how the pages in a Web site are connected. Your Turn Create a line diagram to analyze the parts of a topic you are studying. This activity helps you create a diagram by hand, but you can also download the line diagram template at the bottom of this minilesson. At the top of a piece of paper, write your topic and draw a rectangle around it. Think of the major parts of that topic. How many are there? Draw a box for each part, write the part name in the box, and draw a line connecting the box to the topic rectangle. Think of the subparts under each part. How many are there? Draw a box for each subpart, name it, and connect it to the appropriate part box. Share your line diagram with a classmate and discuss the structure that you have created. Analyzing with a Line Diagram by Thoughtful Learning is licensed under a Creative Commons Attribution-NonCommercial-ShareAlike 4.0 International License. Based on a work at k12.thoughtfullearning.com/minilesson/analyzing-line-diagram.